Historia / genealogica / da casa real / portugueza / casa de Castro. / Lisboa Ao 1742 / Antonio Gaeto de Sousa. Eighteenth century copy of the chapter concerning the De Castro family (part II, chap. 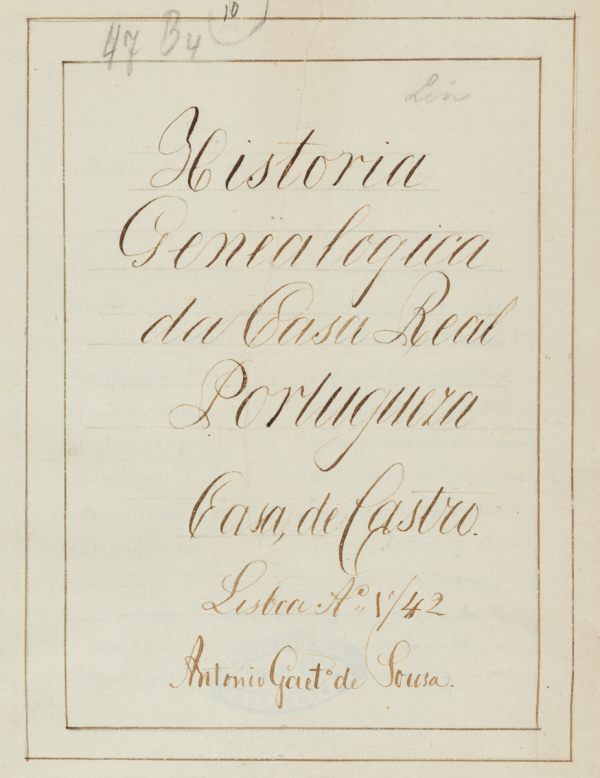 1) of the História Genealógica da Casa Real Portugueza, by António Caetano de Sousa (Ed. princeps Lisbon, 1735). Another copy reposes in this collection, cf. nr. 374. Portuguese / Paper / 19,8 x 15,4 cm. / 37 ff. / 18 lines to a page / Current writing / Text in pencilled frame / Bound together with several other works in modern half-linen binding. Fuks 373. Fundação Calouste Gulbenkian.